Below, is a translation of a text sharing the views of the Head of the UGCC Commission on Ecumenical and Interreligious Affairs, Rev. Ihor Shaban,on the topic of the dialogue with our Orthodox Brothers. There is but The One and Only Church of Christ. All of us Christians, in the "Symbol of the Faith" state: "I believe in One, Holy, Catholic, and Apostolic Church", that is, we admit that there can not be several Churches. At the same time, in each separate place, every church has its own specificity, which is commonly referred to as POMISNIST'. Historically, in 988AD, the Kyivan Church inherited the traditions of the Byzantine East and was an integral part of the Constantinople Patriarchate. However, the Church of Kyiv also remained in complete communion with the Latin West and its head, the Bishop of Rome (the Church of Kyiv and the Church of Rome considered each other to be true churches, mutually recognized all the Holy Sacraments and were in complete unity, so that they could jointly serve the Divine Liturgy at the same altar). However, over time, this unity was broken and the ancient Kyivan Metropolitanate was divided into several branches of the once united Church. Understanding the importance of the command - "that all may be one" (Jn 17, 21), each of the denominations sincerely seeks the restoration of Christian unity that existed under Grand Prince Volodymyr, when the Church was one and not divided, at the same time Orthodox and Catholic, in full communion with all the local Churches of the East and West. 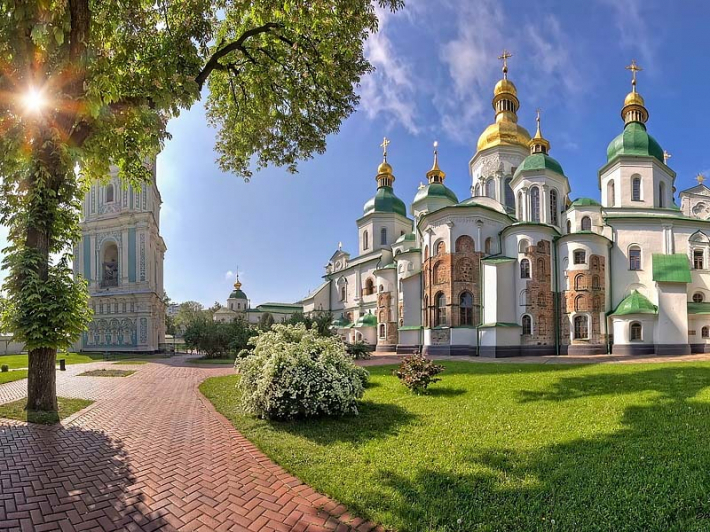 At the beginning of 2019, the Orthodox Church of Ukraine with its leader, Metropolitan Epiphanius, was added to the list of new autocephalous churches. In view of this, many Ukrainians have the hope, not only regarding the change of the name and status of this Church, but above all, regarding the quality of church life. The question remains, will the new OCU be open to dialogue with other churches, in particular with the UGCC, which is a global Church, the faithful of which exist throughout the world, whose bishops though in different nations, are united in the Hierarchical Synod, under the leadership of the Father and Head of the UGCC, Patriarch Sviatoslav (Shevchuk), who while sanctifying the Holy Myrrh, creates a sign of unity and communion of all of his Church? The UGCC dreams of Catholic-Orthodox unity. Today, in the Ukrainian context, the Churches can now begin to look for models of unity together. The Ukrainian Churches now have all the attributes of autocephalous and omnipresent qualities. The UGCC, as a particular Church of its own right (sui iuris), does not belong to the "Latin Patriarchate," just as the OCU is not part of the Patriarchate of Constantinople. It is in full communion with the patriarchs of the East, in the same manner as the UGCC is in communion with the Bishop of Rome. Interestingly, Metropolitan Emmanuel of France in his welcoming words, after the enthronement of Metropolitan Epiphanius, emphasized that the throne of Constantinople was "the first among all the Orthodox Churches of God ...," thus indirectly pointing to the importance of the role of the protos (the first) in the Orthodox world, whose role for the Universal Church in the Ist millennium has been fulfilled by the Bishop of Rome. Such an awareness by the Orthodox Churches of the importance of the protos for the unity of the Church of Christ opens up new opportunities for us to concelebrate at one altar. The conditions for this possibility are few - you must have the same faith, have the same understanding of the Holy Sacraments, fealty to your bishop who has an Apostolic succession, and be in communion with the Bishop of Rome, who is the visible sign of unity among the Churches of Christ without which any local church can not be called universal. Given the context of the modern universal ecumenical movement, one should keep in mind and respect the position of all denominations regarding relations between Churches, because all Ukrainian initiatives and achievements will affect not only internal Ukrainian affairs, but also apply to the whole universal dialogue. Therefore, given the universal dimension of the ecumenical movement, we have a duty to respect and honor the position of the Roman Apostolic See as well as other Orthodox Churches. Restoration of unity between the UGCC and the local Orthodox Churches is only possible if the restoration of ecumenical unity between them and the Bishop of the "Old" Rome is restored. This is the fundamental ecumenical position of the UGCC, since for Kyivan Christianity, the communion of the UGCC with the heir of the Apostle Peter is an important element of its universality. In the Scripture we read that the apostle John was so keen to see that the Lord Jesus Christ was resurrected, that he first came to the tomb ... but did not enter ... he waited for the Apostle Peter. Therefore, at the local level, the Ukrainian Churches, just like the apostle John, in their quest for unity may well be ahead of the ancient Apostolic Churches, but in view of the common goal, they should follow St. John's example ... not to take too bold and hasty steps without other Churches, with which they are in communion in Christ's love.